Your website is the virtual face of your business, attracting web surfers and converting visitors to leads and clients. But to get your website operating at peak efficiency, there are things that every business owner must routinely check off their to-do list. Launching your website was the first step, but like buying a car, there’s maintenance that has to be done – oil changes and tire rotations – if you want to keep it road-ready. Having an outdated website can actually harm your business. Inaccurate information can lead customers astray and cause frustration. Broken links can push your page ranking into the “no man’s land” of Google results (i.e. anything after page 1). So, to help you navigate the pitfalls, we’ve come up with a handful of tips that’ll help keep your website in top shape. All of these techniques are free to implement, they only cost time – but the cost of not doing them will be greater. All the effort you put into your website will go to waste if you post incorrect location or contact information. Think about it – have you ever gotten directions from Google Maps to a local business, only to show up and discover that the business was shuttered months ago? Or perhaps they moved to a new location? Surveys show that when this happens to your customers, 73% of them lose trust in your business, and 31% actually blame your business, even if the listing came from a third party site like Yelp or Yellow Pages. Google is the biggest online directory to worry about, and they’ll sometimes create a profile for your business even if you haven’t registered. Your listing displays working hours, user reviews, location information, the status of your business and more – all of which is accessible when a customer searches for your services. You’ll definitely want to register and run periodic checks to make sure you have the most up-to-date info, so you’re not leading customers astray. Action Required: Get listed or update your listing on Google. To get started, sign in to www.google.com/business with your gmail account. Enter your business name and hit search. If your business location comes up in the search results, click on it. If your business doesn’t show in the results, click on the magnifying glass and then click the option to add your business. Add or update the info for your business and then click verify to initiate the verification process. 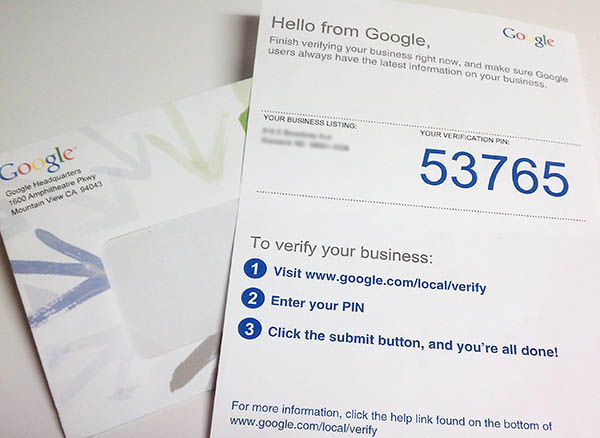 After Google verifies your listing, usually by postcard (phone or instant verification will be available for some but not all businesses), your business will start appearing instantly when customers look you up online. At some point you’ve probably had this experience: you go to a sit-down restaurant, and while waiting for your server you notice that the fork on your placemat is dirty, the prongs are encrusted with somebody else’s leftovers. You’d probably think that the restaurant is unclean, right? You might even think of walking out. This example helps illustrate the concept of “user experience,” which refers to how your customer feels about your website while they’re using it. Spelling errors cost businesses millions of dollars annually. 40% of users will abandon your website if it takes longer than 3 seconds to load in their browser. Broken links also detract from the user experience, harming your business’s credibility and making it harder for customers to entrust you with their personal information. These are the dirty forks that will end up costing you a significant chunk of business if left unaddressed. Action Required: Audit your website. Run a crawl report on your website. A crawl report lists all broken links and URLs present on your website that a search engine can’t access. Some website crawlers go to the extent of determining your page load time. You can use sites like Moz, Screaming Frog, and Website Grader to generate a crawl report for your website, usually for free. Check your website for typos and poor grammar. To help you out, you can use add-ons like Grammarly – a plugin for Chrome which acts as a supercharged spell-checker while you type – and other website-scanning tools such as typosaurus and respelt. The widespread usage of mobile devices and ready access to the internet have given rise to smartphone consumerism like never before. People use their phones for running quick web searches, anywhere and anytime, even while at the office or on the bus. So, that brings us to the million-dollar question, is your website optimized for mobile viewing? If not, you could be missing out on a lot of business since it’s estimated that nearly nine in ten smartphone owners (87%) use their phones to browse the internet. Action required: Optimize your website for mobile viewing. Analyze your website’s mobile-friendliness using this Google tool. Simply enter your website’s URL and click “Analyze,” that’s all you have to do. Knowledge is power. Retain only essential content on your home page – your business’ phone number, address, and a brief rundown of services. Avoid using pop-ups, and make sure any buttons are wide and feature a one or two word call-to-action. It literally takes 30 seconds to find out how mobile-friendly your website is. According to a recent survey, blogging is the third most trusted source in shaping consumer opinion. By posting original content through a blog, you can influence website visitors and potential customers. Not only that, but blogging can also increase the amount of website visitors by 55%. How? Every time you create a post, it becomes an indexable page of your website, which helps boost your search ranking in Google. Blogging doesn’t require any sort of monetary investment on your end. You can start a blog by signing up on free blogging platforms such as Blogger, Tumblr, WordPress or Medium, and start publishing posts right away. Most of these online platforms are extremely user friendly and don’t require heavy tech/coder knowledge. Getting started is the hardest part, and many would-be bloggers falter on trying to find topics to write about. The remedy is to write about stuff that you find interesting or want to know more about; a bored blogger makes for boring content. Action Required: Start blogging and get in the habit of posting regular updates. Start a blog using one of the free platforms linked above, and create a list of some topics you want to learn more about (these will become your future blog posts). The blog serves as a voice for your business, so engage customers with insightful and well-crafted posts. Include images and provide opportunities to share the content through Facebook or other preferred social media. To increase engagement even further, invite guest contribution from bloggers across your industry and enable comments to encourage active participation from your audience. In the digital era, your website is just as important as your physical storefront. And like your physical storefront, it requires consistent upkeep. That’s the bad news. But the good news is that it only takes a small effort and a little bit of oversight, every couple of weeks or months to have an impact. Do these things and you’ll gain access to a global audience: an ocean of laptop and smartphone screens. To sum up, your website is the lighthouse that brings your digital customers to shore. Which of these optimization techniques do you use for your website? Share your experience in a comment below! Great tips. Simple, but easy to forget in the day to day. Better go update my google listing….Thanks again for the insight. Thank you so much. There was quite a bit of information here that I did not know. You have always provided good service, but this type of assistance is beyond anything I had expected and I am grateful. You are an excellent company!